BRONX (WABC) -- New York City Mayor Bill de Blasio shifts his focus to the Bronx Monday, where he'll be working for the week as part of his 'City Hall in Your Borough' tour. It is the second stop on the five-borough tour. 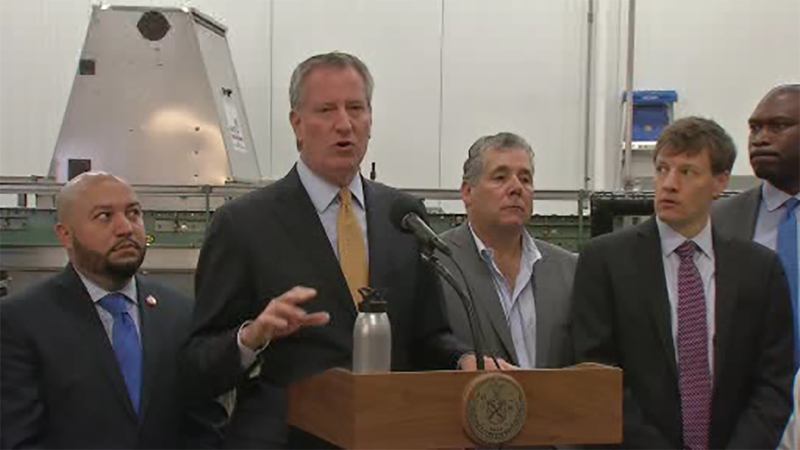 The mayor will tour the Hunts Point Terminal Produce Market and EMS Station 17. The city is investing $150 million in the Hunts Point Food Distribution Center, one of the largest food distribution hubs in the world. "We're expanding and strengthening the hub at Hunts Point to bring even more jobs to the Bronx. This is a crucial link in the city's economy and for our food security. This investment in more modern buildings, transportation and resiliency will protect it for decades to come," said de Blasio. A majority of the city's food supply comes from the Center, including 25% of produce, 35% of meat and 45% of fish. The mayor will also hold his weekly meeting with Police Commissioner James O'Neill in the Bronx.